Hello! I'm playing with LDraw a lot lately, and i decided to implement something to display models with WebGL. I think a WebGL renderer would be great to show off models on the web. No plugin, no downloads, etc. Really great to see that working. Saying that, i've tryed to move 8464 - Cylinders1.ldr and 8464 - Cylinders2.ldr to the bottom but it still doesn't work. No error reported but no model too.. Maybe is too big ? Note that the other problem is still there. Also i noticed that the file use spaces in internal file names, i think brigl don't like that either. The colour number is not off, it's an custom one. ohh thanks! that was the same model too. Regarding filenames with spaces I found no limitation in our specs that they are not allowed. Even more in the spec for OMR the delimiter for set number and set description is " - " (whitespace, dash, whitespace). So your parser *needs* to support whitespace in filenames. Looks rather nice for something "very crude"
But I ask myself why you need a server-side piece of software to achieve that. to avoid all the traffic to ldraw.org. you can display any model a user likes. You can download the .zip do the browser cache of the client. to display OR specify the URL to it. I disagree that parsing ldraw files is easy. It's actually quite annoying in many ways. Not a difficult problem, but with enough quirks to make it painful. Given that the current complete.zip is 19.1MB, I'm not sure that's the best way to work things. Every time it gets out of the browser cache, it would have to be reloaded in its entirety, plus any casual user that just looks at one file would have to wait for the 19.1MB download before anything would happen. Having said that, while ldraw.org does in fact host all of the official (and unofficial) part files on its web server in a fashion that would allow automatic download, ldraw.org is also fairly slow, and getting the parts from there would probably be quite slow. Also, the last time I checked (which was admittedly years ago when implementing automatic download in LDView), gzip compression was wasn't enabled on ldraw.org, so downloading parts actually transfers all the bytes, even though part files compress extremely well, and gzip compression is standard in http 1.1. The only problem is that it would generate 80 asynchronous request to the server, which can be quite a lot. But parts file are cacheable so that should help. then have the client send a "list of needed parts" to it. and then that result could get send gzip compressed to the client. Or store the parts pre-processed somewhere and read that. If you've got them on your own server you're not limited to LDraw File Format. Note that my server doesn't GZip. So there's much room for improvements, for example optimizing part requests, 3d rendering (some better filtering and lighting), zooming, compression of parts, etc. Let me know if something go wrong while you try it. note that there may be some missing parts on the server. "Something went wrong loading: 48\....dat"
and there a lots of these messages after loading the page. Afterwards it freezes saying "Initializing..."
I have the same problem as Willy. Could be an issue with / vs. \ in pathes? is most surely is. you're probably using firefox, right? chrome does slash substitution but firefox not. it's fixed now, can you retry? Working now! Just loaded a MPD containing an unofficial. Jaw-dropping! Still nothing here. Could a cache issue be possible? Philippe Hurbain Wrote: Still nothing here. Could a cache issue be possible? Maybe yes, did you tried cleaning your browser cache? More details: Works fine with Chrome, but not with Seamonkey (a Firefox variant). and then seeing the model so beautifully is just amazing. that it is NOT tied to either iOS or Android, but still can be seen on mobile devices, as long as the browser sports WebGL. This embodies the MAIN principle of the Internet, offering contents INDEPENDENTLY of OS or browser brand. Flash or Silverlight, which again would be vendor-specific. Good decision, and an impressive prototype. Kudos! The center of rotation currently seems to be hardcoded 0/0/0. I would better like to have it at the model's center, like in LDView. that it confuses me. I would love to see a big similarity in mouse handling between the 2 tools. perhaps it is very easy to do, and you could show the model already while it is loading. the user can watch the downloaded parts appear in the model. I think it could be quite cheap to do, because you already know all the matrices etc, just the "real" part data is missing. Thus, you could already build up the necessary data structures, and skip them on rendering, while the model is not fully loaded. Nicola, you seem to currently use 0/0/0 always for default color 16. I would prefer if you would use the color specified explicitly in LDConfig.ldr (some "medium" default grey). To you already use that file? You can always get the most recent version also from the ldraw.org site. you currently are not rendering edges at all. I would like to have a checkbox or button for toggling that on and off. It should be nearly trivial to add the drawing of them to your existing implementation. Yes that's hardcoded now. I don't know if ldview calculates the center automatically or uses some metadata in the file. i have to make some tests. Yeah i considered it too.. Seeing the model progressively being built would be awesome. It might not be very hard but needs some modifications on the program. I've yet to understand completely how color works, but i got that 16 is actually the "current color", and i correcly substitute it with what "parent lines" says, it's not hardcoded to 0. What i miss is the whole "complementary" colors and code 24. Normal edges would be trivial, conditional edges will be not They're one of the most puzzling quirks of LDraw file model. Basically you cannot just send them to OpenGL as a bunch of vectors, you have to manually test one by one and decide if you should draw them with a quite complex algorithm. It looks like some kind of hardcoded, precalculated "toon shading" like algorithm? What i'd like to do is to use them to see if faces should be smooth or flat (basically what they tell is if the two faces should be "curved" or separated) so that i can render curved part nicely, but that require some work. Steffen Wrote: Nicola, I am again falling of my chair, impressed. plus unofficial parts, it loaded quickly and smooth, and looked beautiful! Indeed, color 16 "inherits" color of parent part. Problem is if there is no parent (eg. if you paste the code of a LDraw part in copypaste.html). This requires the definition of a "default color" to be used in that case. Color 24 does the same, but for edge lines. Quote: It looks like some kind of hardcoded, precalculated "toon shading" like algorithm? Quote: What i'd like to do is to use them to see if faces should be smooth or flat (basically what they tell is if the two faces should be "curved" or separated) so that i can render curved part nicely, but that require some work. and i correcly substitute >it with what "parent lines" says, it's not hardcoded to 0. What i miss is the whole "complementary" colors and code 24. As Philo already answered, colors 16 and 24 are for "use parent color". I just asked to correct the implementation of "what to do when there's no parent". For example, I put some unofficial part from the parts tracker into your tool. I know, I was asking just for the simple, normal edges. Oh ok, didn't noticed this Implemented! line rendering is very limited becouse: 1) Three.js doesn't support different materials for same line geometry, so only black edges for now, and 2) line width is fixed to one pixel becouse the parameter is ignored (see here, looks like a webgl gap). In linux it should look better. One thing missing (but then - it's experimental! ): orientation/scale should be kept when changing step. I think that the computation of the part center for rotation is not correct. does not rotate about its center. It rotates around "some other point". Nicola, I am again falling of my chair, impressed. I was able to run this in Iron/Chrome, but not in Firefox. Quote: "Your graphics card may be WebGL-compatible, but it’ll be blocked in Firefox if the driver version is 0.0.0.1 behind the approved list." 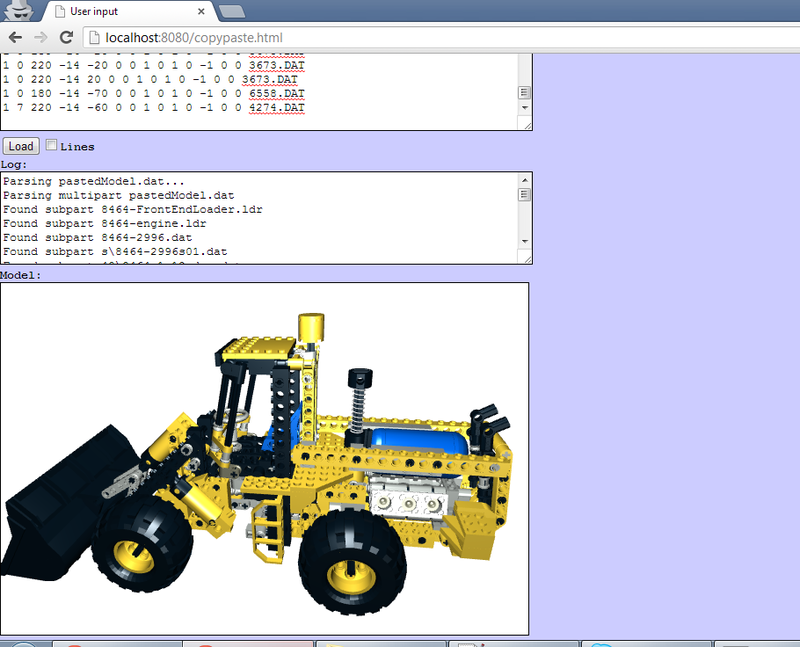 , and voila, I also had WebGL in Firefox without problems. Maybe it's the same for SeaMonkey. How do we implement such a renderer into the forum or the CMS once it if fully featured? Well it's just importing the .js files and glueing some html and php for the forum. The problem is making the parts avaiable on the server. They must be on the same server since they're fetched by ajax, or in a server that implement the Access-Control-Allow-Origin directive. BUT only activate your renderer for logged-in forum participants. and at the same time get the nice feature of 3D viewing arbitrary LDRAW files in realtime in the forums. I still wonder if this is doable - Orion? then why shouldn't we be using it in the forums and the PT? I'm also setting up a public repository (with instructions and sources) so i can stop spamming here. Quote: I'm also setting up a public repository (with instructions and sources) so i can stop spamming here. That's not spamming! please keep us informed! I totally agree that is hard (having done it in LDView). Looking at your samples, though, it looks like you did a great job; the results look awesome. The animations are really cute, especially the bounce at the end! But "lines" example does no longer work here (hangs up at "generating geometry") (browser=Seamonkey 2.14.1, tell me if you need other details on my machine). Very impressed with what you've got there. Recently thought i'd give WebGL a go my self. Mainly to replace the ancient LDraw cad software i made about 8 years ago: http://news.lugnet.com/cad/?n=11299 It's still available from that link if your interested. Looks like your about two months ahead of me in dev. I have models loading and showing with nice normal's etc but it's all server side gen. Will let you know when i get mine up on a server. Much rougher than yours atm. But here is my WebGL LDraw project. The parts list on my server is a cut down one, so most models won't work yet. Daniel B Wrote: Much rougher than yours atm. But here is my WebGL LDraw project. That's great An online editing tool would be nice! I would like to use this on my website. Can't wait!! I had also an eye on that, but for me it was not "straight forward" so I pushed it away that day. Maybe you can write some lines how to make it work. maybe I am tooooo stupid. Yes, some instructions would be nice, as well as a zip file with everything we need in it. Michael Horvath Wrote: Yes, some instructions would be nice, as well as a zip file with everything we need in it. Ok, i'll write something. The hardest part is preparing the part library: pieces must be spread in different folders becouse servers tipically don't like 7000+ files in a single folder (btw this is something LDraw could consider too, that is not a good thing in general). I'll write a little utility to do that. I have no control over the file system. I just rent space from a web hosting company. from the perspective of the ldraw library, "parts" are in a, or better, in one "folder". if this number of files is big and the filesystem internally wants to spread this, it can do. outside, to the user, it should still be a single folder. While I'm not advocating splitting things up, it's definitely not up to the file system. The whole stated problem is that some file systems have problems when there are a large number of files in one directory. To be honest, I don't think the 6000+ files we have now is causing problems, but the file system can't internally spread them out, because that would redefine the meaning of a directory. As for searching, do you do your searches against the actual files on the disk, or using tools based on LDraw? Any change to the folder structure would require updating all tools to support the change, which is why I don't think it will ever (or even should ever) happen. But since the tools would have to be updated anyway, a change in the underlying structure wouldn't change the user experience for people using the tools. your Brigl renderer is really awesome. I gave it a try and it works great for my concerns. I hope it is still ok for you if I use it on a webpage (e.g. http://www.digital-bricks.de/en/index.php?site=flp)? Question is: Is there a way to use it here on the forums in some ways? For example generating pics of models or parts people just submit as .ldr or .dat and a pic of the content is added to the post? Here's a more detailed howto. You can take a look at the simplest example here. Rebrickable is also using brigl on their part detail page. indeed, the LDraw site should have the complete library online (can somebody confirm that?). folder structure (one folder or your suggested subfolder structure). I would really like to see your Brigl renderer used at the parts tracker and / or in this forum. is there any way to have it parse it properly? I'm having trouble implementing the viewer. Everything seems to be working fine. The log messages are displaying but the viewer doesn't appear. What should the library path I pass to the viewer be relative to? The html file containing the viewer code? Absolute for the webserver? I use the relative path from the html file containing the viewer code. When your parts folder and this file are in the same folder you may try "./parts/". Ok. It was a path and permissions problem with my local server. Hopefully I fixed it and can have this up soon on the forums. Still getting a 403 forbidden error code even though I've set the parts directory to global read/write. Any ideas? This is totally on my end and in no way related to the brigl software. I'l have to troubleshoot some more. Ok, I've worked out the bugs. Now clean up the viewport code and implement fallback code. Orion Pobursky Wrote: Ok, I've worked out the bugs. Now clean up the viewport code and implement fallback code. Hello there! Sorry, for some reasons i didn't received notifications and missed these new posts! As usually happens when I'm near in completion of a project, real life got in the way. Hopefully I'll have some free time during the holidays to finish up the half a dozen little LDraw items I've been working on. I have download all sources and parts, upload them on my server. Implement the viewer, but nothing appear !!!! I just try to see the part 3005.dat. Been playing around with Brigl and must say I love it. Is there any way to revise or enable LDraw's standard parts directory listing instead of the parsing your JS proposes or the no subdir option (which forces everything into a single directory)? Nathanel Titane Wrote: Is there any way to revise or enable LDraw's standard parts directory listing instead of the parsing your JS proposes or the no subdir option (which forces everything into a single directory)? it is some time ago now, but I once wrote this post. I think this is exactly what you are looking for? Thanks the nosubdir option actually use the standard part directory listing, it is not that it require a single flat directory. Just use the option and plug your library as is, it should work. Nathanel Titane Wrote: Nicola, any way to add touch event listenenrs to brigl? Actually that is Threejs stuff. Brigl basically create a Threejs object, and then you can do whatever you want with it. I included the BriglContainer code that will create a very basic Threejs scene, but that's just for convenience. Brigl already support mouse event, so i guess you need touch events such as from tablets or smartphones? Nicola, any way to add touch event listenenrs to brigl? Is your brigl project on bitbucket still active? Can I send you a patch with these changes? Hi, very interesting, expecially the update of three.js. Have you adjusted the smoothing algorithm too? I remember that newer version of Three.js didn't have Quads anymore, and that broke my smoothing algorithm. I'm not developing brigl anymore, but if i have the time i can try to merge your stuff. Yes I did adjust the smoothing algorithm for the lack of quads. It is a little more complicated but it still (seems) to work..
My e-mail address is on my github page if you want to contact me directly. I've tried using your new version on the OMR website and I'm still having the same problem as before your updated version: the log shows it's loading all parts (which I indeed see being downloaded in the browser), then the log shows "Model loaded successfully", but there's just nothing. No model, no error. Just that message. Mind you: this is on my localhost and not on the 'real' omr server of course, but still... Everything seems to be working, except the actual webgl viewer. Am I just being overlooking something completely obvious? Does it work on either of these sites? Can you send me the file? I can try it to see if it works for me. Yes, it works perfectly fine on those websites and yes, I know about the development tools. I looked at this doc and my guess is that maybe it is a resizing issue. What is the initial size of the model_container div element? BRIGL won't resize the element, it will just draw it at whatever the current size is. Also, BRIGL doesn't handle resize events so the element has to already have the correct final size before rendering. Is there a publicly accessible version somewhere that I could try and load in my browser? Oh my god, you're right! I completely missed the fact that the div element needs to be set at a certain size manually. I was expecting Brigl to... just put the viewer in there. Well, not really expectingin, I didn't even think about either way. Actually, now I think of it, it's quite logical that it doesn't set its own size (I mean, it doesn't know what size it should be). Maybe you can include it in the HOWTO.txt? Ah well, it's working now. Thanks a lot! It is good to hear that it is working now. Thank you for the suggestion, I added a note to HOWTO.txt and a warning message to BriglContainer. It doesn't have any problems with the %20, but the ' (which is transformed into ' seems to be a problem. That doesn't work. Is it possible to add support for those links? It would be nice if Brigl would detect a large model (e.g. models with more than 1500 parts) and if it detects one, it doesn't load the model without the user's 'permission' (e.g. a button). Those are 2 things I can think of at the moment to make it more suitable for the OMR. Does Brigl still require all parts in separated directories? No. You can also use 1 folder with all parts. Altough you do need to combine all p and parts folders of both official and unoffical in 1 huge folder. That's still less than ideal to the point where I wouldn't really want to use it. Hmm, I need to follow this topic. No further comments, but this is great. I just copy/pasted a model and it looks very nice! It doesn't have any problems with the %20, but the ' (which is transformed into ') seems to be a problem. As long as I actually have a file with that name in the correct location. 2) This might be better done with some sort of wrapper rather than brigl itself? The code that is generating these web-pages could perhaps insert a button for large models? Anyway maybe you'd be interested in forking the project and creating a pull request for this change? Could someone write a tutorial on getting this to work on one's own site? The brigl site does not have instructions. Thanks. (2016-07-28, 10:20)Michael Horvath Wrote: Could someone write a tutorial on getting this to work on one's own site? The brigl site does not have instructions. Thanks. Where is the readme? I can't even find a download link on the Brigl site. It's this HOWTO.txt file I was referring to. Okay thanks. I did not realize it was on github. Does anyone know how to write a Windows batch file that sorts the parts library into sub-folders based on the first letter in the file name? The docs say that this should be done for performance reasons. Thanks. Never mind. I was able to move everything manually. It is weird that your models need to go in the parts directory. I'd rather put them in a "models" directory next to "parts". Could this be changed in the future? Thanks. I tried enabling the "dontCenter" option because I want the script to use the model's coordinate system, but this placed the camera directly at the robot's feet. I could not zoom out any further. 1. One problem I noticed is that the viewer doesn't detect when the mouse leaves the display window. As a result, if you are holding a mouse button down when the cursor goes off screen, the viewer still thinks it is pressed when returning to the screen, even though you are likely to have released the button by then. 2. It would be nice to change the background color. I use a gray color normally in LDView. 3. How should we advertise for Brigl? Just link to the github page? 4. I would like to turn studs off to speed up rendering. Overall, performance is not as great as LDView. 5. Large models take a while to load. A better indication of loading using a GIF animation would be good. 6. Moving the scene using the middle mouse button is slow. You have to do it over and over again to make progress. 7. I added a border "border:3px double #888;" to the container, but the display overlaps this border to the bottom and right. This model crashes Chrome for some reason, and results in a black screen in IE. Not sure why. The others work. Lack of memory? If you are using the Github version of Brigl and you'd like some help, or you've found a problem, please open an issue on the Github project page. For reasons unclear to me, even though I think I'm subscribed to this thread I never get any e-mail notices about new posts. (2018-02-19, 22:59)Hazen Babcock Wrote: If you are using the Github version of Brigl and you'd like some help, or you've found a problem, please open an issue on the Github project page. For reasons unclear to me, even though I think I'm subscribed to this thread I never get any e-mail notices about new posts. I think I fixed the issue. Not sure. Thanks! I'm getting the e-mail notices now. For what it is worth: loading stops at "Loading 3-4ndis.dat" in Firefox. (2018-02-20, 12:01)Jaco van der Molen Wrote: For what it is worth: loading stops at "Loading 3-4ndis.dat" in Firefox. I just checked simple with Firefox 58.0.2 (64-bit) and it loaded correctly. That simple loads fine with me too. It is loading many dat files but stops at "Loading 3-4ndis.dat"
(2018-02-20, 12:34)Hazen Babcock Wrote: Sorry, loading of what? There seem to be two problems here. The first is that this model requires two files 'm6666.ldr' and 'm6643.ldr' which are not found on this server. The missing file problem then triggers a call to an error callback function which has a bug, causing an exception and stopping the model loading process. I think the bug is fixed in the current version of BRIGL, but there is not much I can do about the missing files. I installed the latest GitHub version. My first model loads eventually, but there are dozens of 404 errors in Chrome's Developer Tools. If I try a larger model, it does not load properly, and eventually results in my whole website becoming unresponsive for 15 minutes or thereabout.